How to calculate on-standard efficiency and overall efficiency? What are the differences between these two efficiency terms? These are the new terms to many industrial engineers and production people. If these terms are also new to you, read this post. Workers performance and production line performance is measured in efficiency. Efficiency is calculated using the formula that we have discussed in an earlier post with an example. When an operator works on a bundle (garment pieces) they produce standard minutes whether she works on-standard operation or an off-standard operation. But when an operator does nothing but sitting idle due to some reasons is lost time. If an operator does not get work, that is not her fault. In such cases, if you measure her performance considering all the attended hours, that will reflect a wrong performance. For this reason, on-standard efficiency is measured where only on-standard work hours are considered for calculating efficiency. Measuring on-standard efficiency is good for operator skill analysis but when it comes for production at the end of the day, or line efficiency, and incentive calculation for the line and individual operator, overall efficiency is used for eligibility level. (F) During lost-time, practically, no garment will be produced, so no produced minute for lost time hours. The standard produced minute is calculated as operation SAM x Number of pieces stitched. If there is no lost time and no off-standard work hours employee's on-standard efficiency and overall efficiency will be the same. If there is lost time, overall efficiency will be less than the on-standard efficiency. Watch this video for overall efficiency calculation method. An employee produced 300 units of SAM 1 minutes in 8 hours. Out of 8 working hours, 1 hour is measured as lost time due to machine breakdown and no feeding od cuttings. Calculate on-standard efficiency and overall efficiency of this employee. You see efficiency loss in the line efficiency. Some of the reasons for efficiency loss in a plant are unmeasured lost-time, off-standard work done by sewing operators. When on-standard efficiency is measured, you can get an accurate operator performance (efficiency data). For preparing the operator skill matrix factory should consider their on-standard efficiency instead of considering overall efficiency. The challenges in measuring on-standard efficiency are not having the right tool for capturing lost time data. With a print format, you can capture lost-time data but that would be limited, not the true lost-time hours. 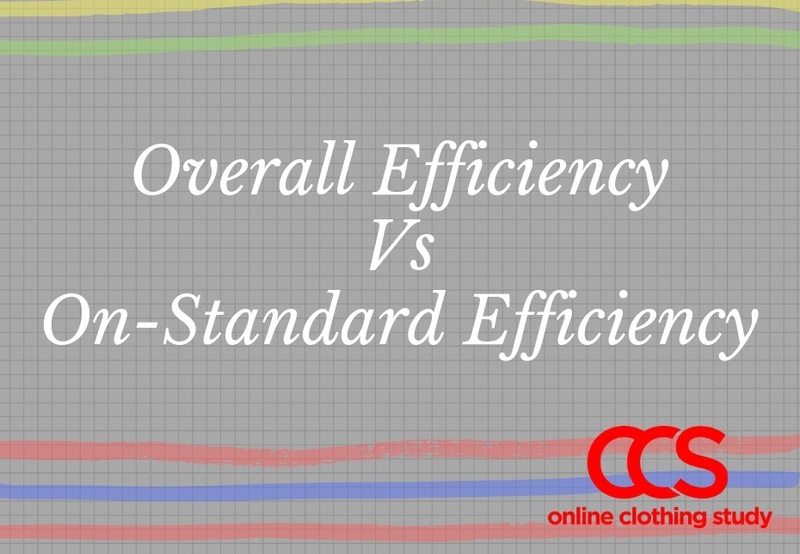 Understanding the difference between on-standard efficiency and overall efficiency. Efficiency calculation method.